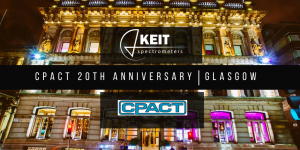 Keit wishes the Centre for Process Analytical and Control Technologies (CPACT) a happy 20 years of existence! We are in Glasgow, Scotland on 3-4 October to help CPACT celebrate their two decades of research and collaboration. Founded in 1997, CPACT is based out of the University of Strathclyde in Glasgow and brings together industry and academia to advance process analytical technology. Keit is a proud industry member and joins in with the other 31 industry and 11 university and research organisations to address challenges in manufacturing process and control. As part of the special anniversary programme, our own Dr. Jonathon Speed will be presenting an industrial case study on Day 2 (Thurs 4th October). Read a past CPACT poster on an early use of our Keit instrument for quantitative in situ analysis of liquids. Most recently, we are currently participating in a new project with CPACT and IBioIC to compare four different spectroscopic techniques in process monitoring. Follow us on LinkedIn to see the results when they are released. Can’t make it to the celebration in Glasgow?